You’re gathering together a group of family members, friends and/or coworkers for a night on the town. Why expect all of them to travel separately and take each of their private vehicles? Not only does this waste gas and create potential safety issues, but it also keeps the party-goers from hanging out together as they head to their destinations. The answer is simple: Get a party limousine service. At Premiere #1 Limousine Service, we have vehicles that can accommodate up to more than two dozen passengers. These 30-passenger party bus vehicles allow you to make sure your whole group gets securely where you want to go — and has a great experience in the lavish style of our party bus limos! Call our Middletown, PA offices to book one of our luxury vehicles for your next night out with friends at (717) 616-8995. You don’t need to worry about a designated driver — How many times have you been the designated driver, or has a friend been the designated driver? It’s a necessity if you’re operating a private vehicle, but it’s not critical if you’ve hired our trained, dependable chauffeurs to pick you up and bring you home. We want you to enjoy safer wine tasting tours, brewery tours and nights on the town. You can make a huge splash with friends, coworkers and relatives — Imagine how amazed the people in your life will be when a 20 passenger limo bus comes to pick them up! There’s no doubt about it – limos of any size turn heads. All of our vehicles, from regular stretch limos to party buses, are immaculate and look amazing. You’ll feel like a superstar riding with Premiere #1 Limousine! You can save a bundle of money — Because we’re so accustomed to driving our own vehicles every day, we forget that we’re spending money every time we pull out of the parking space, garage or driveway. Not only do you have to keep filling up your tank, but every mile adds wear and tear on your vehicle. If you have a party in your future, call us for an economical solution. From bachelor and bachelorette parties to office events, Premiere #1 Limousine is the only limousine service in central PA that you’ll ever need. Contact us today to talk about how we can make any night on the town more memorable! Have you and your friends been looking for an excuse to party together like you used to before you grew up, got married and had kids? 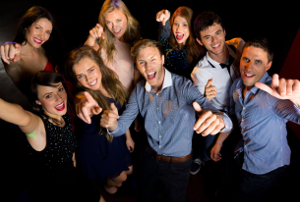 A night of safe fun is always on the menu when you hire a mini party bus from our limo service serving Dauphin, Cumberland, York and Lancaster counties. Just rent one of our vehicles, let us know your itinerary and we’ll do the rest. You and your friends can settle back in our comfortable, luxurious seats. Our drivers can take you to any place you want in the region, and you’ll never have to worry about anything except having the time of your life. It’s the perfect solution for girlfriend getaways, couples’ nights out, family gatherings and more. When businesses decide to have celebrations involving nights out for employees, vendors, contractors and/or clientele, they appreciate being able to take advantage of our party bus rental in central Pennsylvania. A party bus is a fantastic and economical way to ensure that every person gets to and from his destination safely. Our professional chauffeurs will pick up all the occupants on time, and will continue to adhere to your schedule throughout the evening. There’s no need to worry about designated drivers or stopping for gas at the local station — all you have to do is sit back and bask in a luxurious, smooth ride. We take great care of our 30-passenger party bus and limos. Not only are they thoroughly cleaned before and after every use, but we also keep them functioning at their highest levels. We spare no expense to keep you and your guests exhilarated as you travel from one central PA night spot to another. Plus, our chauffeurs live and work in the Susquehanna Valley region. They know the most direct routes to get you where you need to be. When you want to book your party bus adventure, or consider taking the fun to a new level by incorporating a party bus in one of our special packages, contact us at (717) 616-8995. We can even help you decide where to take your group for a memorable night out in Harrisburg, Lancaster, York or other nearby cities! Imagine the look on the faces of those in your group when they get picked up in one of our exceptional party buses! It’s a first impression that sets the tone for the whole night. Let us turn your next evening out into the party that everyone talks about for years! You set the plan in action, and we’ll make sure to execute it beautifully and successfully. Contact us today!